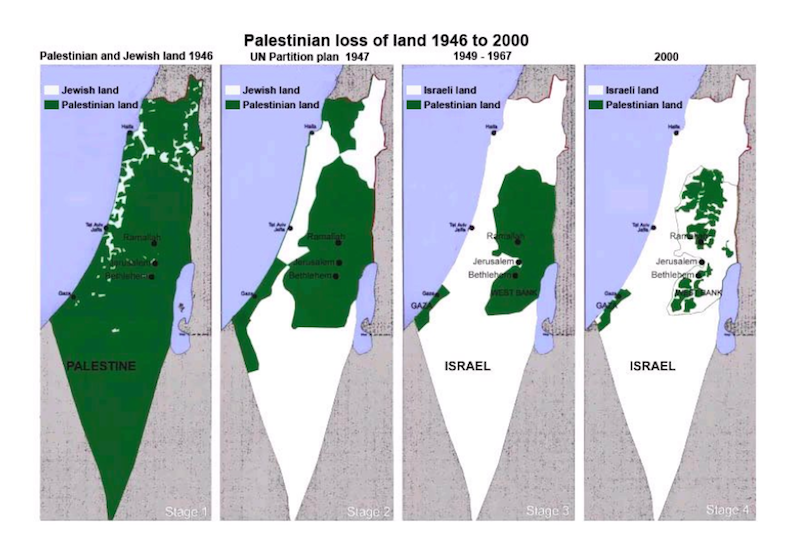 … As part of my original posting, I mirrored a map of modern Palestinian history that has the virtue of showing graphically what has happened to the Palestinians politically and territorially in the past century. The first map thus shows what the League of Nations imagined would become the state of Palestine. The economist published an odd assertion that the Negev Desert was ‘empty’ and should not have been shown in the first map. But it wasn’t and isn’t empty; Palestinian Bedouin live there, and they and the desert were recognized by the League of Nations as belonging to the Mandate of Palestine, a state-in-training. The Mandate of Palestine also had a charge to allow for the establishment of a ‘homeland’ in Palestine for Jews (because of the 1917 Balfour Declaration), but nobody among League of Nations officialdom at that time imagined it would be a whole and competing territorial state. There was no prospect of more than a few tens of thousands of Jews settling in Palestine, as of the mid-1920s. (They are shown in white on the first map, refuting those who mysteriously complained that the maps alternated between showing sovereignty and showing population). As late as the 1939 British White Paper, British officials imagined that the Mandate would emerge as an independent Palestinian state within 10 years. People like Goldberg never tell us what they expect to happen to the Palestinians in the near and medium future. They don’t seem to understand that the status quo is untenable. They are like militant ostriches, hiding their heads in the sand while lashing out with their hind talons at anyone who stares clear-eyed at the problem, characterizing us as bigots. As if that old calumny has any purchase for anyone who knows something serious about the actual views of Israeli Prime Minister Binyamin Netanyahu or Foreign Minister Avigdor Lieberman, more bigoted persons than whom would be difficult to find. Indeed, some of Israel’s current problems  with Brazil come out of Lieberman’s visit there last summer; I was in Rio then and remember the distaste with which the multi-cultural, multi-racial Brazilians viewed Lieberman, whom some openly called a racist.